Scripophily.com ®, the Internet’s largest buyer and seller of collectible stock and bond certificates, has seen considerable interest in the acquisition of Standard Oil Trust stock certificates signed by John D. Rockefeller. 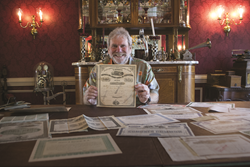 The Standard Oil Trust stock certificates were issued in 1882 and were printed by the Franklin Bank Note Company. The certificate was hand signed by John. D. Rockefeller, Henry Flagler and Jabez Abel Bostwick and is over 135 years old. “The Standard Oil Trust began in 1882 by merging all of John. D. Rockefeller’s oil properties and had an initial capital of $70 million. There were originally forty-two certificate holders, or owners, in the trust. After ten years the trust was dissolved by a court decision in Ohio due to violation of the Sherman Antitrust Act which was an attempt to restrain the power of trusts with respect to restraint of trade or commerce.” according to Bob Kerstein, CEO Scripophily.com. Standard Oil Trust lost a Sherman-related lawsuit in Ohio in 1892, but it was later able to incorporate in New Jersey as a holding company when New Jersey had adopted a law that permitted a parent company to own the stock of other companies. It is estimated that Standard Oil owned three-fourths of the petroleum business in the U.S. in the 1890s. Rockefeller held the title of president of Standard Oil until 1911, but he retired from active leadership of the company in 1896. In 1911 the U.S. Supreme Court found the Standard Oil trust to be in violation of the anti-trust laws and ordered the dissolution of the parent New Jersey corporation. The thirty-eight companies which it then controlled were separated into individual firms. Standard Oil of New Jersey (SONJ) – or Esso (S.O.) – renamed Exxon, now part of ExxonMobil. Standard Trust companies Carter Oil, Imperial Oil (Canada), and Standard of Louisiana were kept as part of Standard Oil of New Jersey after the breakup. Standard Oil of Indiana – or Stanolind, renamed Amoco (American Oil Co.) – now part of BP. Standard’s Atlantic and the independent company Richfield merged to form Atlantic Richfield or ARCO, recently part of BP but has since been sold to a Japanese company. Atlantic operations were spun off and bought by Sunoco. Standard Oil of Kentucky – or Kyso was acquired by Standard Oil of California – currently Chevron. Standard Oil of Ohio – or Sohio, acquired by BP in 1987. The Ohio Oil Company – or The Ohio, and marketed gasoline under the Marathon name. The company is now known as Marathon Petroleum, and was often a rival with the in-state Standard spinoff, Sohio. Standard Oil of Iowa – pre-1911 – became Standard Oil of California. Standard Oil of Minnesota – pre-1911 – bought by Standard Oil of Indiana. Standard Oil of Illinois – pre-1911 – bought by Standard Oil of Indiana. Standard Oil of Kansas – refining only, eventually bought by Indiana Standard. Standard Oil of Louisiana – always owned by Standard Oil of New Jersey (now ExxonMobil). Standard Oil of Brazil – always owned by Standard Oil of New Jersey (now ExxonMobil).